When they purchased the 280 acres of land, the vineyard needed to be planted, as the area in the Rutherford appellation had not cultivated yet. They brought in their friend, Jean Claude Berrouet, the wine maker at Petrus to help consult on the project. By this time, Berrouet was familiar with Napa, as he was involved at Dominus. 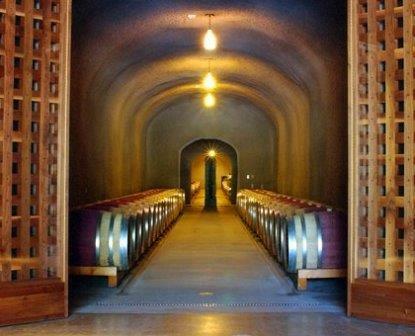 Their early wines were made at the Franciscan winery, until Quintessa was able to complete the construction of their own new, state of the art, wine making facilities and cellars in 2002. Aaron Pott was the wine maker for a while. Michel Rolland joined the team as their consultant in 2010. While Quintessa is a total of 280 acres, only 170 acres are under vine. The vineyard, located just off the Silverado trail is planted to what you might find in a typical Left Bank Bordeaux estate. The vineyard is planted to 129 acres of Cabernet Sauvignon, 26 acres of Merlot, 7 acres of Cabernet Franc, 4 acres of Petit Verdot and in a nod to the owners roots, 4 acres of Carmenere. There is also 2 acres of vines planted to Sauvignon Blanc. Due to its unique terroir, Qunitessa is one of the few vineyards with terraces in their vineyards. The vineyard is subdivided into 26 separate parcels. In the cellars the wines are now vinified in 26 different vats, made of both stainless steel, and large, oak, truncated shaped tanks. This allows for true for parcel by parcel vinification. Quintessa Cabernet Sauvignon, which is a blend of all the major Bordeaux varietals, made its official debut in 1994. This is their flagship wine. Quintessa Faust, which made its debut in 2002 is designed as their second wine. The wine is made from a combination of young vines, declassified lots of Quintessa and purchased grapes. The majority of Faust comes from the purchased fruit. Quintessa Sauvignon Blanc Illumination comes from a blend of estate fruit and purchased grapes planted in Napa Valley and Sonoma. Quintessa wines are best served at 15.5 degrees Celsius, 60 degrees Fahrenheit. The cool, almost cellar temperature gives the wine more freshness and lift. Young vintages of their red wine can be decanted for 1-3 hours, depending on the character of the vintage. This allows the wine to soften and open its perfume. Older vintages might need very little decanting, just enough to remove the sediment. The red wine of Quintessa is best served with all types of classic meat dishes, veal, pork, beef, lamb, duck, game, roast chicken, ribs, hamburgers, barbecue, roasted, braised, grilled dishes and stews. Quintessa is also good with Asian dishes, hearty fish courses like tuna, salmon, mushrooms and pasta. The white wine of Quintessa is best served with all types of seafood and shellfish, sushi, sashimi, chicken, veal, pork and cheese. Oaky, but once past the sweet oak, the wine is full bodied, rich, deep and concentrated. Dark in color, with round textures and an open style, it is easy to enjoy the dark fruits, licorice, chocolate and black cherry notes. A nice Bordeaux styled wine from Napa focusing on elegance, soft textures and smooth textures in a forward, medium/full bodied, ripe, sweet, fresh, fruit filled style. Full bodied, polished and round in texture, this blackberry and cassis filled wine pops with its spicy berries, licorice and coffee bean nose. A year or two will soften the tannin and add more complexity to the wine. Spicy red berries, vanilla, smoke and earthy black cherry notes open to a forward, polished, soft, medium/full bodied wine that ends with a jammy blackberry finish. Oaky, ripe, jammy berries, licorice, medium/full bodied with a jammy finish that displayed a touch of heat. I would not age this wine, as it seems to lack the stuffing for much development. Light and starting to fade, the fruit is taking on a tart quality. Drink up.